Have the adventure of your life keeping up with the Joneses. Relive the fun and excitement of keeping up with the Joneses in Indiana Jones and the Last Crusade (Disc 3). In a prologue that reveals a young Indiana Jones (River Phoenix) in one of his first adventures, this thrilling screen epic continues as an adult Indy embarks on a perilous quest to find his cantankerous father, Professor Henry Jones, Sr. (Sean Connery). The Nazis are on the trail of the Holy Grail, and have kidnapped Indy's father, the foremost authority on the Cup of Christ. Follow Indy as he inches through the rat-filled catacombs of Venice, battles Nazi flying aces in a thrilling biplane dogfight, and braves the thunderous fire-power of an unstoppable tank. 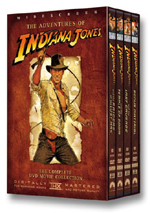 And behold the Holy Grail's power to give and take life, as Indy and his father race against time in this classic DVD. $24.400 million on 2327 screens. Following the glory that was 1981’s Raiders of the Lost Ark, 1984’s Indiana Jones and the Temple of Doom left a bad taste on many viewers’ mouths. It still proved to be a success, but it actively turned off parts of the audience and it left the future of the Indiana Jones franchise in doubt. Crusade opens with an introduction to a teenaged Indiana Jones (River Phoenix) in 1912. This gives us a glimpse of the distance at which his father keeps him, but mostly it just acts as a fun way to start the flick. From there, the movie jumps ahead 26 years to the adult Indy (Harrison Ford) who soon learns that his dad (Sean Connery) has gone missing during a quest to find the Holy Grail. Aficionado of rare antiquities Walter Donovan (Julian Glover) recruits him to continue this crusade, though Indy treats it more as a rescue mission to find his dad. This leads him first to Venice, where he searches the catacombs along with his father’s partner, Dr. Elsa Schneider (Allison Doody). They attempt to stay one step ahead of some zealots who oppose their quest for the Grail, and they eventually head toward Austria to retrieve the senior Jones. When they get to that land, they find Henry Jones Sr. and bust him out of a castle. From there the movie follows the continued trek to find the Grail and keep the Nazis away from it. The quest includes help from Indy’s boss, Dr. Marcus Brody (Denholm Elliott), and his loyal assistant Sallah (John Rhys-Davies). Probably the biggest concern with Crusade stems from its “been there, done that” quotient. Like Return of the Jedi heavily echoed Star Wars, Crusade bears more than a passing resemblance to Raiders. Indy goes up against the Nazis again to retrieve a mystical artifact, and this takes him to the same part of the world at the end. Both enjoy the same generally light-hearted tone and a climax that brings Indy up against supernatural forces. I get the feeling that director Steven Spielberg and producer George Lucas didn’t handle the moderately negative reaction to Temple terribly well. Its dark tone caught fans off guard and didn’t please many of them. Because of this, the pair may have retreated to the safety of the first flick’s attitude. Crusade feels more like a piece connected to Raiders, but that’s a mild problem since the pair seem rather similar; it might have been nice to see Crusade stretch a bit more. However, the results are generally a lot of fun, so I can forgive Crusade its less than creative side. Well, I feel that way once we get past the first act, at least. From the wild adventure with young Indy and the antics in Venice, Crusade presents a lot of action in its first act, but it doesn’t quite connect in the exciting and lively way we saw in Raiders. The action seems more perfunctory and less inspired than I’d like. Once we get to Austria, though, the movie improves considerably. A lot of this comes from the formal introduction of Connery. He and Ford enjoy an absolutely splendid chemistry and really click together. Their rapport helps carry the movie’s slower moments, and they create a nice bond that makes them a wonderful father and son team despite the fact Connery’s only 12 years older than Ford. The pair shine together and create the movie’s highlights. Yeah, a lot of acts two and three of Indiana Jones and the Last Crusade feel like moderate retreads, but Spielberg executes those moments so well that I don’t care. The film lacks the freshness of Raiders but it still proves to be a lot of fun during these sequences. Ultimately, Crusade lacks great originality, but it remains a lively and satisfying adventure. 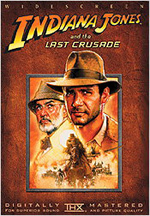 Indiana Jones and the Last Crusade appears in an aspect ratio of approximately 2.35:1 on this single-sided, double-layered DVD; the image has been enhanced for 16X9 televisions. Another solid transfer, Crusade concluded the trilogy on a satisfying note. Just like both movies seemed similar, the image of Crusade definitely echoed that of Raiders. Sharpness usually looked excellent. A few of the wider shots presented some slight softness, and a brief but odd blurriness affected parts of the frame during a scene with Indy, Sallah and Henry in a car late in the second act. Otherwise, though, the picture appeared nicely detailed and crisp. A few slight instances of jaggies and shimmering popped up, but these stayed minor, and the smidgen of edge enhancement also failed to create any real distractions. As for print flaws, they stayed away here as they did in the first two movies. I noticed no signs of any defects in this clean and distinctive image. Colors looked solid. The movie didn’t present the world’s broadest palette, but it included a good enough range of hues that consistently came across as tight and vibrant. The tones never seemed overly heavy, and the film gave them good definition. Black levels seemed deep and dense, and low-light shots demonstrated fine clarity and never became too thick. I found little about which I could complain as I watched the consistently positive visual presentation of Crusade. In addition, the Dolby Digital 5.1 soundtrack of Indiana Jones and the Last Crusade seemed even better. Both of its predecessors presented strong soundfields, but Crusade outdid the pair. The mix offered a broad and engaging experience. Music showed nice delineation and spread, and the effects created a good sense of atmosphere. A lot of directional dialogue appeared throughout the film, and those pieces popped up in a natural way. Effects seemed appropriately placed and blended together smoothly. Those elements moved cleanly across the channels to demonstrate a fine feeling of place. Whereas both of the first two flicks offered a few small instances of split surround material, Crusade clearly upped the ante in that regard. It didn’t seem to present more active rear speakers than the others - Raiders contributed an awful lot of audio from that realm – but the elements were more naturally blended due to the stereo nature of the surrounds. These helped bring the back speakers into the flick in a more involving way, and they added a lot to the movie, especially during its many action sequences. Audio quality appeared fine and never showed its age. Speech was distinct and concise, and I noticed no issues connected to intelligibility or edginess. Music remained vibrant and dynamic, as the DVD once again displayed John Williams’ score with vivacity and solid clarity. Effects were as clean and rich as ever, and they never suffered from any signs of distortion or other problems. Bass response was deep and firm and brought good punch to the package. The audio of Crusade wasn’t just good for its age. This was an excellent soundtrack that almost never felt like something made 14 years ago. Almost no supplements appear on the disc for Crusade. We find nothing more than a link to a DVD website - not yet active as I write this review - and the THX Optimizer, a program to help you configure your home theater. 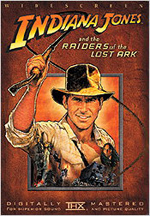 However, Raiders comes only as a part of a four-disc package called The Adventures of Indiana Jones. This set includes all its substantial extras on the fourth DVD. Because of that, I didn’t issue a grade for the special features, as I’ll reserve that judgment for my article that covers the fourth disc. 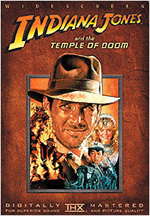 While Indiana Jones and the Last Crusade didn’t live up to the heights of Raiders of the Lost Ark, it definitely topped Temple of Doom, and it finished the trilogy well. The movie boasted wonderful interactions between its lead actors and seemed quite entertaining and enjoyable. As with the first two DVDs, Crusade presented very positive picture, and it gave us the strongest audio of the three. I like Crusade quite a lot and definitely recommend it. As previously noted, Indiana Jones and the Last Crusade can be purchased only as part of a set. This box also includes Raiders of the Lost Ark and Indiana Jones and the Temple of Doom as well as a disc devoted to supplemental materials. Any discussion of possible separate releases falls squarely within the realm of speculation; no official sources have even hinted of such a possibility.